Is there a better day to share a great crockpot meal with you than on a snowy day? I think not. We’re getting pounded with 24″+ in CT today and while I made this pulled pork a couple of weeks ago, I’m kicking myself for not having something to throw in the crockpot today. I mean, yes it’s wonderful to have the crockpot going while I’m at work and then come home to a fully cooked meal but it’s another thing to be home all day while dinner cooks and you get to smell it cooking. Regardless of when you decide to make these sandwiches, you certainly won’t regret it. They are drop-dead delicious; the pork made perfectly tender from a 8-10 hour day in the crockpot with a sauce that will make you cry when it drips down to your elbow because you aren’t going to want to waste any of it. Did you see the coleslaw on top of these babies? It’s a must! Slaw on pulled pork isn’t something I’ve seen much of here in the Northeast but we were willing to give it a shot and it totally makes this whole sandwich. 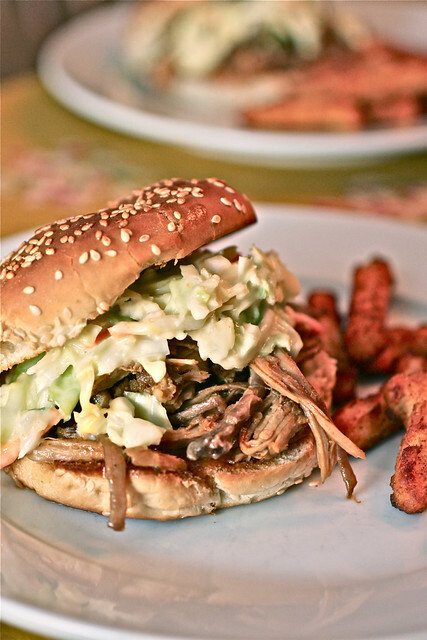 The cool, crisp, and tangy slaw with the savory and barely sweet pork gives you a sandwich you will not want to put down. I know virtually everyone has a favorite recipe so I’d love it you’d link your favorite pulled pork (or chicken) recipe in the comments below. Sprinkle all side of the pork roast with salt and pepper. In a large saute pan over medium-high heat, warm the canola oil. Add the pork and cook, turning frequently, until browned on all sides, about 10 minutes. Remove the roast from the pan and set aside. Pour off all but 2 tbsp of the fat from the pan. Add the onion and saute over medium-high heat until softened, about 5-7 minutes. Add the garlic and cook for 1 minute. Add the broth and season to taste with salt and pepper. Transfer the pork to a slow cooker and add the broth mixture. Cover and cook until the pork is very tender, 8-10 hours on low heat. Transfer the pork to a platter and let cool for a few minutes. When the pork is cool enough to handle, pull the pork into shreds, removing all of the fat and gristle. Return the pork to the slow cooker. Add the barbecue sauce, the mustard, the honey, 1/2 tsp salt, and 1/4 tsp pepper. Stir well, set the temperature to high, and cook uncovered while stirring frequently until the flavors are well-blended and the sauce has thickened, about 30 minutes. Serve warm on rolls with coleslaw, if desired. Transfer the pork to a large heavy-bottomed pot or Dutch oven and add the broth mixture. Cover and cook over medium heat, turning the pork occasionally, until tender, about 2hrs. Transfer the pork to a platter and let cool for a few minutes. When the pork is cool enough to handle, pull the pork into shreds, removing all of the fat and gristle. Return the pork to the slow cooker. Add the barbecue sauce, the mustard, the honey, 1/2 tsp salt, and 1/4 tsp pepper. Stir well, set the temperature to high, and cook uncovered while stirring frequently until the flavors are well-blended and the sauce has thickened, about 30 minutes. Serve warm on rolls with coleslaw, if desired. In a small bowl, whisk together the mayonnaise, honey, cider vinegar, and celery seed until the mixture is smooth. In a large bowl toss together the dressing mixture with the coleslaw mix (or cabbages and carrots) until everything is completely coated by the dressing. Chill for 30 minutes before serving. Tara, you are making me so hungry! Isn’t there just something fantastic about the smell of your slow-cooker making something delicious while it snows outside? My favorite snowy day meal is definitely this one: http://www.cooklikeachampionblog.com/2010/05/southwestern-brisket-tacos-with.html. I never liked coleslaw and meat together until trying those. I’ve made this both with white wine and red wine and it’s fantastic. That sandwich looks amazing… wish I had some for lunch!! This looks delicious! I don’t have a favorite pulled pork recipe because I’ve never made it myself, but the first time I try I’ll keep this one in mind. I put my pork in a slow cooker too. I use a pork loin and brown sugar, cumin, red pepper flakes and tabasco. Its perfect every time.